Houseplants: It’s September, which means it’s time to start taking the steps necessary to transition houseplants from outdoors in. To help your plants adjust to the decrease in light they will experience, place them on the east side of your home or a shaded area. The east side offers sun in the morning and protection from the harsh sun of mid-day to late afternoon. Let houseplants sit in this area for a few weeks. If temperatures at night go below 55 degrees, be sure to move into a garage or another environment which provides protection from cold temperatures. If you pay attention to the daily forecast you’re ahead of the game. Annuals: Some annuals have more legs than others. You may have some spring/summer annuals that are healthy and will continue to bloom until frost, while others are visibly struggling and need replacing with fresh fall annuals. Chrysanthemums are the most widely known fall blooming plant, but there are many more plants that provide beautiful warm fall tones either by blooms or foliage. Herbs: Herbs add flavor to summer foods, but there’s no reason why they can’t be added to fall recipes as well. Bring plants like chives and parsley inside, repotting if necessary, so they have a better chance of surviving the fall. Summer plants: If you aren’t ready to say goodbye to some summer plants just yet, a sheet or other lightweight material can be used to cover annuals and vegetable plants, as long as it isn’t made of plastic. This measure will lengthen the lives of these garden staples, protecting them from the elements as the seasons change. 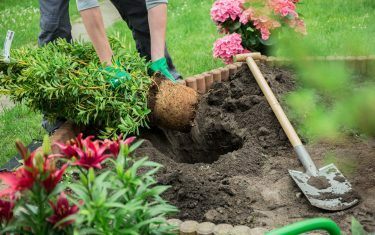 Soil: After producing plant life all summer, it’s probably time to rejuvenate the soil in your garden. Manure, compost and leaves are the types of organic matter that nourish your soil, nourishing your plants in turn. Watering: Now that summer is on its way out, you can ease up on your watering routine, thankfully. Less hydration at this point actually ensures that plants will handle the winter better. In early fall, moderate your watering routine accordingly. Conveniently, natural indicators will tell you when it’s time to give certain plants in your yard a deep watering. When the leaves start to fall from deciduous trees, that’s a reminder that they, as well as shrubs and evergreen trees, need a good dose of hydration before the ground freezes. Autumn colors: Get in the seasonal spirit by adding some autumn color to your yard! If you want to warm up the color palette of your garden you could introduce shades of red, for instance. Trees that would do the trick include dogwood, red maple, sugar maple, Norway maple, red oak and scarlet oak. If you prefer shrubs, take a look at available sumac, viburnum, winged euonymus and barberry. Berries: Fall-appropriate foliage and flowers aren’t the only features to look for when choosing among plants to add to your garden in September. As long as they aren’t poisonous, berries are also good characteristics to keep in mind when searching for new plants that will make for a festive autumn yard. Wood ashes: If you spend time around an outdoor fire pit in the fall, for example, the resulting ash can be collected for your yard. An easy way to nourish plants involves spreading wood ashes amongst flower and vegetable gardens. Phosphorous, potassium and calcium do wonders for greenery. Raking: Leaves are going to start dropping more and more. Establish a good raking routine now so you can stay on top of this chore during the autumn months. Regular raking gives pests fewer places to hide. Get the rake out whenever there’s a good rainfall or the lawn has just been mown. Gardening supplies: Stock up on your favorite fall supplies while there are still plenty to choose from. If you need more pots, potting mixes, or fertilizers, pick some up while they’re available. If you want to be even more ambitious about your autumn gardening this year, try something new!